Argentina Red Stag are also known as Red Deer they are another exotic species brought to Argentina from Europe for the purpose of hunting. In the beginning of the twentieth century they were introduced in the region of the Caldén (native tree) woodlands in the Province of La Pampa. A few years later the Red Stag was taken to the woods of the Andes, where it is now thriving in the mountainous regions. 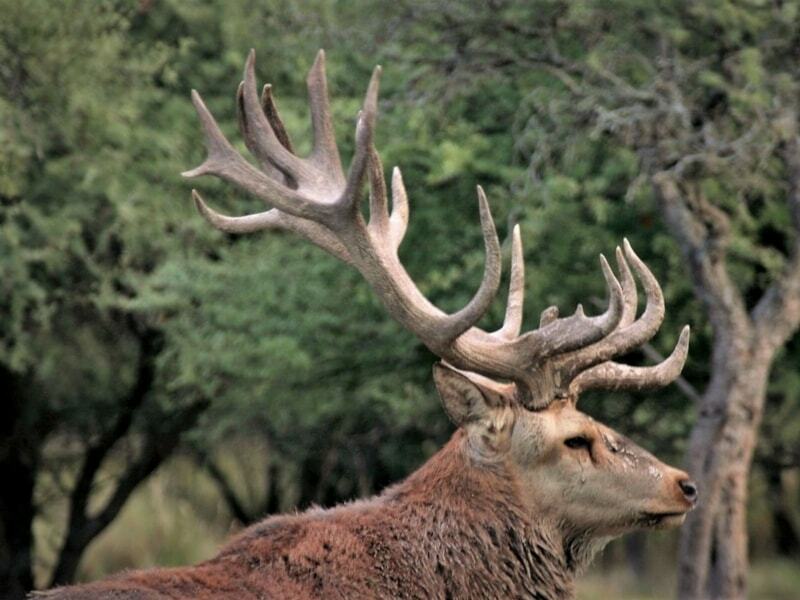 Today the Argentina Red Stag can be found in many locations throughout the country. Red Deer are the 4th largest deer in the world just behind Moose, Elk and Sambar Deer. The have an impressive figure, its size can be longer than 2 meters, they have a wide chest, with slender and strong legs and in the case of the Stags (males) big antlers that shed every year starting around August. 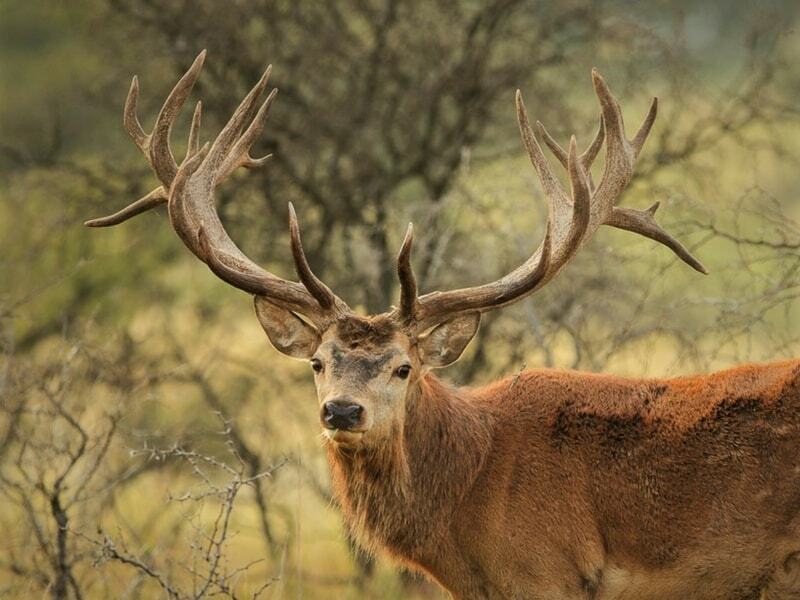 Red Stags can easily weigh more than 300 pounds and with special diets they can reach over 500. The females, or hinds, are not as big as the Stags, they do not have antlers, but offer the hunter a meat with an excellent taste that is low in fat and rich in proteins. 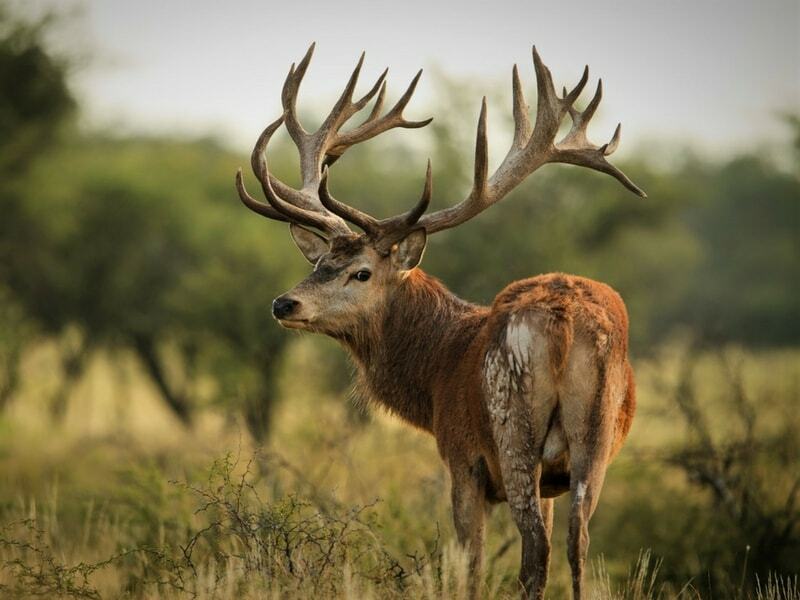 According to the European measurement rules (CIC) the quality of the trophy is measured by the quantity of the points, length and thickness of the antlers, symmetry of them, total weight of the head, etc. We measure them according to the SCI system which is basically based in the addition of inches of all the tines. The hide of the Red Deer is reddish in summer and more grayish in winter. Red Deer generally live in the protection of the bush or woods. They are nocturnal and can be found grazing at night. Red Deer have amazing agility to jump and are can run up to 40 mph. In the heat of the day they enjoy visiting water holes to bath themselves in the water or mud. Most of the year the Stags live separately from the hinds but in March and April, when the hinds are in heat in the Southern Hemisphere, the stags and hinds get back together and then the "brama" begins, which is a term equivalent to "roaring". This sexual call which takes place during mating season basically consists of a profound, powerful and prolonged bellowing with which can be heard for miles. The old stags, which are the ones will become sexually active first. They form their harems and impregnate the hinds which after 40 weeks give birth to one or two fawns. Hunting Red Deer is done in the early hours of the morning or at dusk. The hunter looks for a strategic spot where he can hear the stags' roaring. Following their calls, the hunter approaches his selected trophy. In Argentina still-hunting at night is allowed. Assisted by the moonlight the hunter lies in wait for an animal at a water hole or feeding area previously established. Shooting distance average: 150 yards. Adequate caliber: 30.06 Springfield, 7 mm Rem Mag., 300 Win Mag., 338 Win Mag.